Tile in a tiny house is a natural choice for anyone who admires how versatile and sustainable tile is. 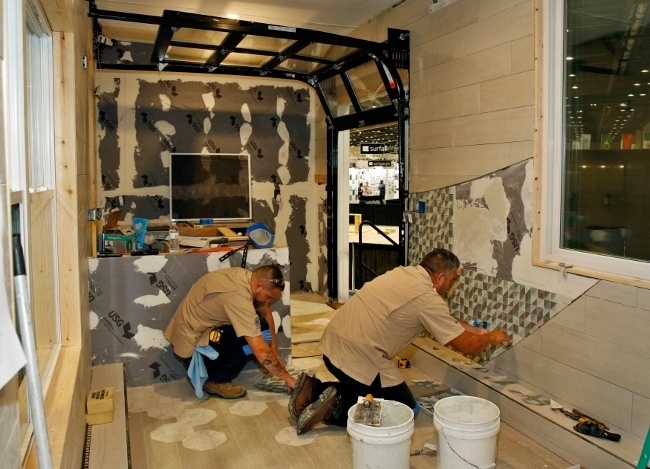 It's also a must for those participating in the live installation of tile in three tiny houses on the Coverings show floor as J&R Tile did during Covering17 in Orlando, Florida. 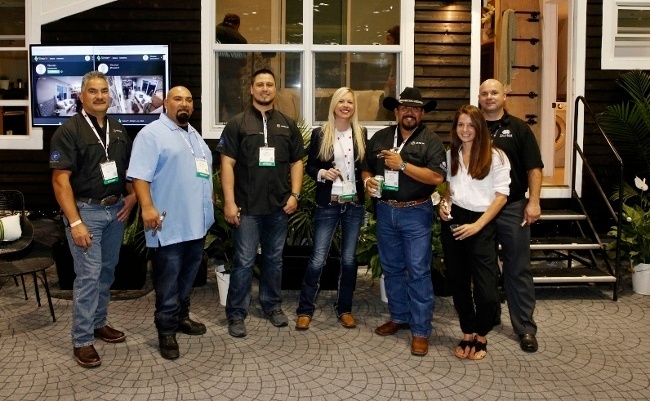 J&R Tile, a National Tile Contractor Association (NTCA) Five Star Contractor, is based in San Antonio, Texas and Erin Albrecht, J&R Tile Director of Operations, strongly supports the Certified Tile Installer program. 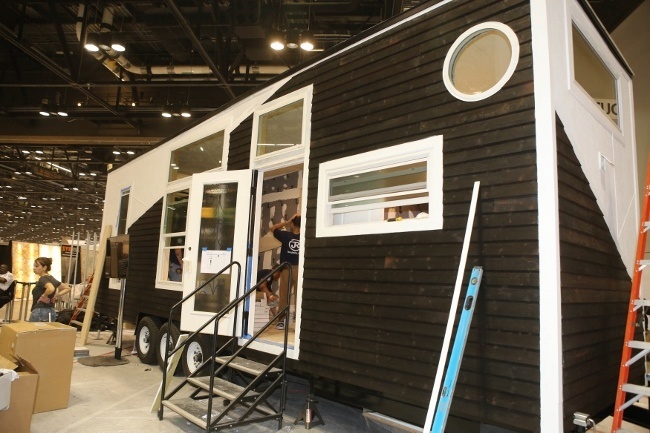 We caught up with Erin to ask her about her tiny house experience during the Coverings17 Installation Design Showcase. CTEF: Erin, how did you get involved in this Installation Design Showcase project? EA: Bart and the NTCA invited us and we were of course thrilled for J&R to be featured. We accepted the invitation to showcase our staff's skills at Coverings 2017. CTEF: How did you connect with Nikki Vega from BlueTreeHome? EA: We connected via many phone conferences and meetings prior to the show for coordination. The first time we met Nikki in person, we were out in the parking lot of the Orlando Convention Center working on our negotiation skills with Freeman, the Coverings freight handling company, to get the house moved inside so we could get to work on it. I knew it was going to be a good match the minute we met! We have stayed connected with Nikki through social media and emails, and are even collaborating on a couple of projects together in Miami and New York City. I'm happy to say we have stayed connected! Business is all about relationships, and we are so grateful we met such a brilliant young talent. She is so extremely talented. Wait, am I lobbying for Nikki at IDS Tiny House 2018???? CTEF: What kind of pre-planning was involved and how did it differ from more traditional projects? EA: We are a very collaborate team at J&R. 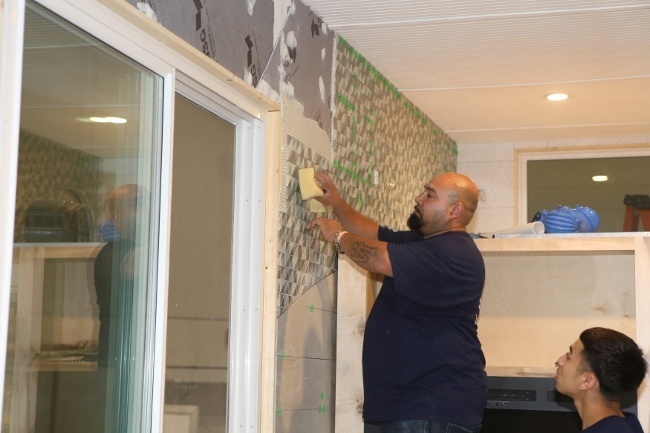 The installers and office personnel are not disconnected, we have meetings and discuss every project. In fact, our Installation leadership team has input on what projects we participate in, phasing/layouts etc. Triniti Vigil, who is CTI and ACT certified, and Adam Arrellano fabricated the waterfall edge countertops before Coverings17 at J&R in San Antonio, with the great help of John Cox getting USG's foam substrate shipped and delivered. Not too much different than a normal project during pre-construction. We collaborate with our installation team about potential issues and best practices, and have an open dialogue for solutions to keeping the same design intent. EA: Nikki had some very intricate details, such as the hexagon inlay fabricated custom into the porcelain wood plank floors, which of course took some extra time, and a glass mosaic feature wall at several radius turns at a different thickness as the wall tile that needed to be furred out and prepared for a seamless look. 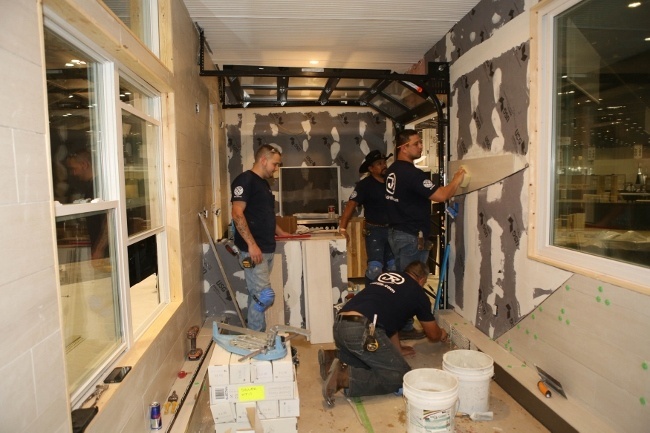 CTEF: What tile products were installed in the Vitruvian tiny house? 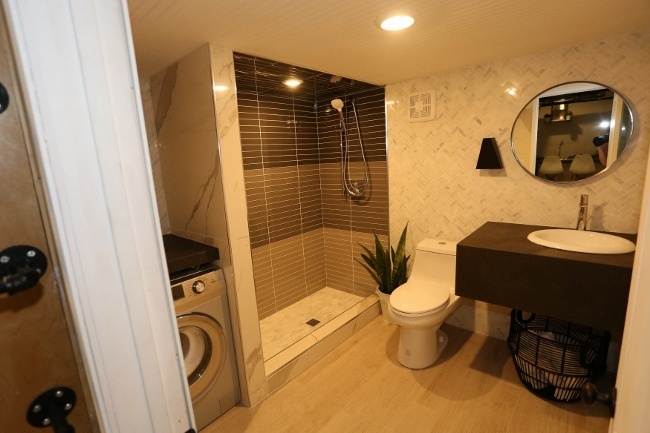 EA: The porcelain tile installation consisted of Crossville's Laminam 5.6mm collection on the countertops, and restroom walls, Speakeasy collection on planks and hex, and Glass for mosaics and shower walls was 2"x12" Groove Glass- all with Schluter Systems finishing trim profiles. 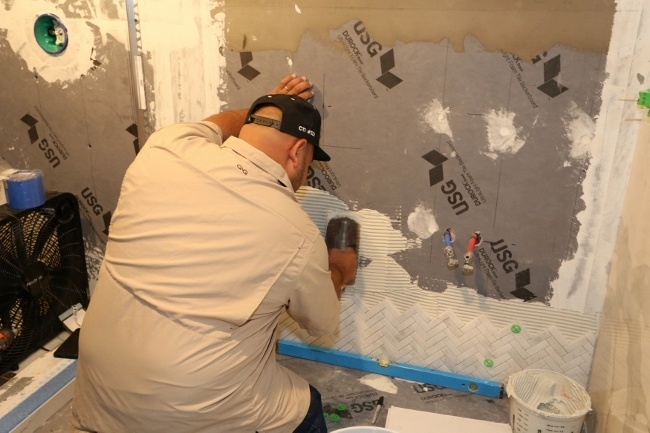 All adhesives and grout selections were through Ardex Americas, and the shower system and substrate were all USG Foam. Almost the entire install was with Ardex's X77 fiber reinforced thinset, which is a staple at J&R for glass and LFT. Special thanks to Skip Starks from Tavy Tools for the TAVY Spacers. CTEF: Who from J&R Tile was involved in the project and how? EA: Triniti Vigil, Adam Arellano, Eleazar Maldanado, and Jimmy Martinez were our Certified Tile Installers (CTIs) who are also ACT certified. 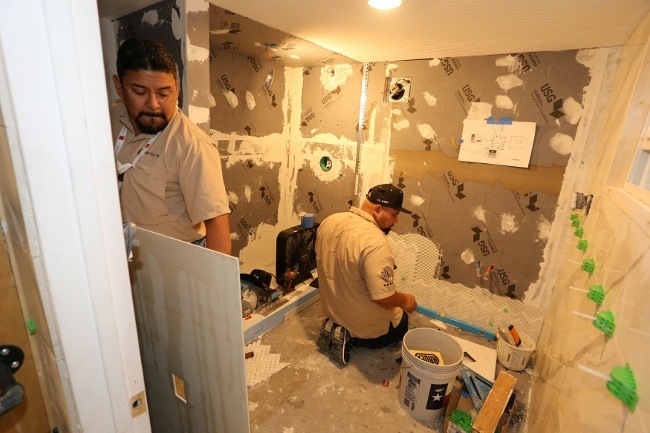 Ezekiel Rodriguez, Pedro Villaneava, Christian Carrillo and Javin Flores were our apprentices (now registered in the State of Texas under the Department of Labor). Christine Kotara, our CEO, even flew in for a couple of days to pitch in and give her support (and got her hands dirty)! EA: The team is excellent at time critical installations. 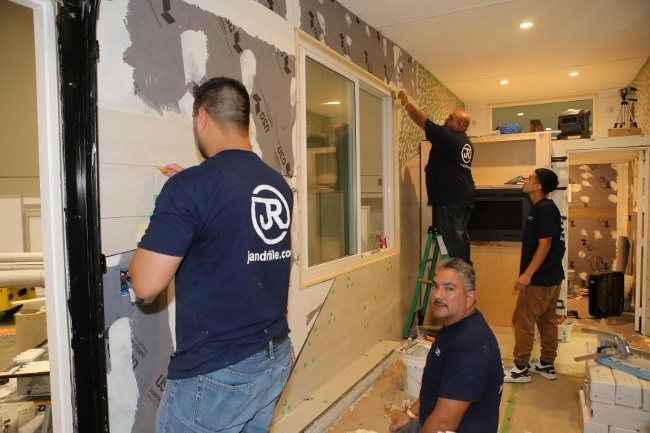 Professionalism and attention to detail are some of J&R's core values, and everyone on the team displayed flexibility and ongoing communication with Nikki which made for a very organic, fun flow of details until completion. Our team's ability to communicate and work with owners/designers/architects is something we take great pride in, and it showed in this showcase. EA: Well, the house showed up the wrong color, and Nikki ran out and bought some paint, and Frank Galvan (Ardex) and his wife Bre were by our side the entire installation and helped me paint the exterior. That Ardex CA20P came in handy! Frank is also a CTI, and a big partner of ours in what we do back in Texas. He had some special "swag" made for the staff. Jimmy, Nikki, and I were feeling adventurous and decided to run the glass mosaic on the loft sleeping area upstairs on the radius return of the circular interior window jamb. It is a very fun detail, but took him in a crawl space floating out the substrate with quite a bit of glass fabrication. It turned out to be one of the most special details and can be seen from the exterior of the home. 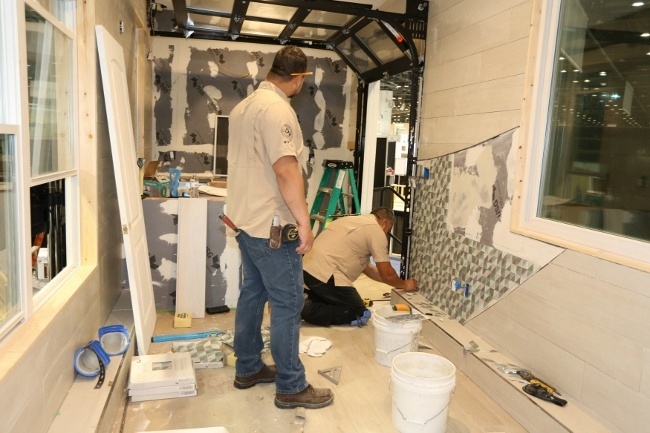 Knowledge of substrate preparation for Large Format Tile/Thin Porcelain full size slabs, with the integration of movement joints is crucial for a Tiny House on wheels. A moving home with tile is similar to a giant elevator, so deflection is really on a much larger scale. Lack of mortar coverage to TCNA standards, movement joints incorrectly placed, or any detail missed could lead to failures during transportation. CTEF: Erin, any other important points to highlight? EA: The use of our IQ dustless saw saved us quite a bit of time on the Porcelain and Stone by Crossville. Paul Guth from IQ even came by and calibrated it during the show. Ben from ETM, and Mick Volponi from MLT for their help and tools for the thin porcelain Laminam install, and a special thanks for always picking up the phone and being supportive. We had friends in the industry from around the country come by and help in crunch time, members of the NTCA & CTIs. Special thanks to Christopher McNeely (King Pookie Diamond Blades special shipped a glass blade for us), Jamen Matthew & Chanel Carrizoga from Icon Tile & Design (helped finish out back wall with an audible and late shipment), Edwardo Martinez & Greg Twarog from Surfaces 15 (were running around the show helping us find some things needed at the last minute), Dan Hecox who help with some trim out details at the last minute, and Angie Halford & Rod Katwyk who came by to pitch in a last mosaic minute detail and work with Nikki. Darren from Freeman was so much fun to work with (he's a character), and Elena Grant from Taffy, and John Cox are quite the duo (and fun dynamic personalities) to put all of this into action. Thank you for promoting qualified labor, we are working hard in Texas for installers in 2017 to have more CTIs. CTEF: Thanks very much, Erin, and congratulations on a beautifully tiled Vitruvian tiny house! 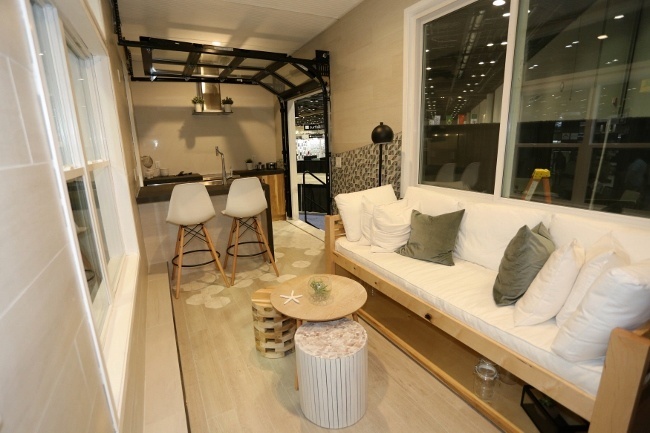 What do you think of tile in a tiny house? 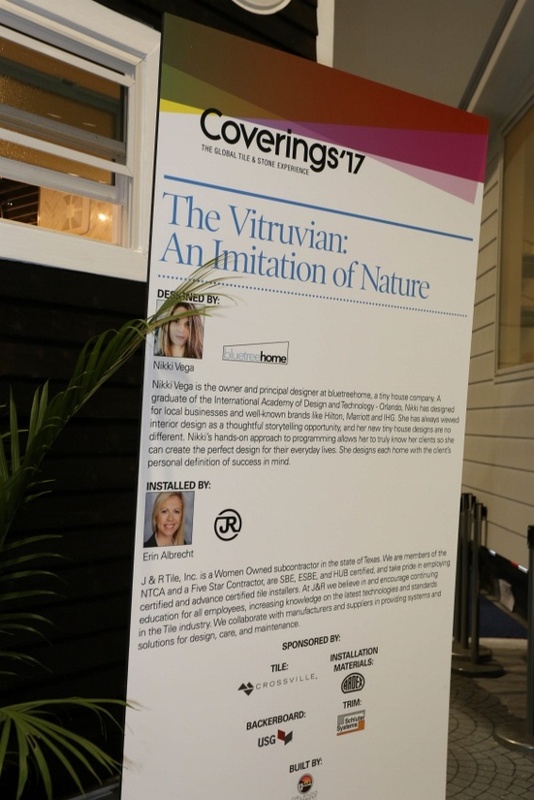 Did you get to see the Vitruvian at Coverings17? What did you think? Let us know in the comments.